An Intel Core i7 processor. I think those criteria generally fit with the needs of the average developer. While there will always be improvements possible via bumping specs, this served as a baseline which almost all the machines could meet. 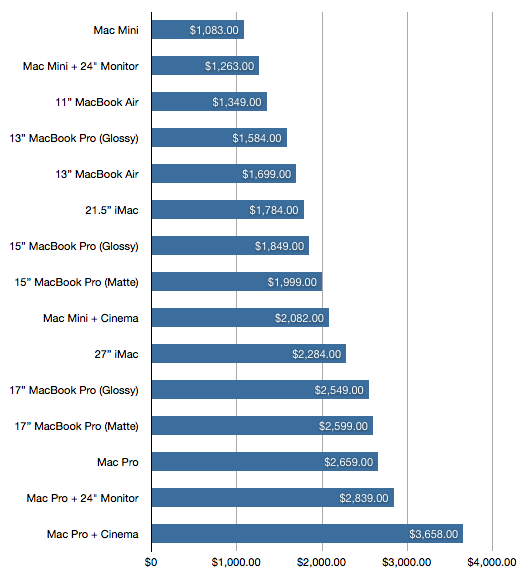 Based on that data, I’d recommend the Mac Mini as the best choice for a developer looking for a new machine. If you absolutely need portability then the 15” MacBook Pro (Matte) is the clear choice. You would, however, be paying $736 (+58%) for the ability to move it around. You can pick up a refurbished late model 11” MacBook Air for $749, which might be a better choice to get in addition to the Mac Mini. With either choice, I’d recommend upgrading the internal drive to an SSD, which currently runs you $199 for 115GB. This is probably the biggest reason I’d stay away from the iMac right now. Upgrading the hard drive in an iMac is a risky proposition, at best. The only Apple available SSD option is a $500 256GB add-on.